The guy in charge of waving the Syracuse flag after scores must have been mighty tired on Saturday night. 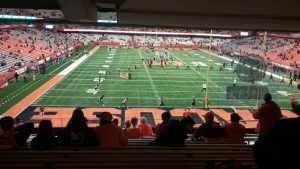 It was Parents’ Weekend for everyone else at Syracuse University last weekend, as the Orange football team hosted nationally ranked North Carolina State. But for me, it was Homecoming Weekend. It’s always Homecoming when I get back to the campus in Central New York. Like seemingly half the sportswriters and sportscasters in the United States, I graduated from Syracuse. For example, before the game I bumped into Ch. 2’s Stu Boyer – whom I knew at Syracuse when we were both students in the Class of ’77. The place has changed quite a bit since I left. The space once held by the school newspaper – my home away from home for two years – is now the host to a parking ramp. An empty lot in front of my junior dorm is now the site of a building named after legendary football player Ernie Davis. Most strikingly, though, the Carrier Dome wasn’t around when I was here. That building certainly changed the SU skyline substantially. The area was never about the buildings, though. It was about the friendships that were made during that time. I still keep in touch with bunches of them, thanks to the wonders of holiday cards, emails, and Facebook. It’s also the place where I had my first stories printed professionally. Heck, I covered Jim Boeheim’s hiring as basketball coach. I’m still at it, 40+ years later. (So is he.) No wonder a smile comes to my face merely by walking around the place. This story, then, is a little different than the others I’ve written in this irregular series. It’s not a tale of a stranger in a strange land, trying to discover what it’s like to attend a particular sporting event in a new place. No, I’m more of a tour guide, pointing out things as we look around and providing some history lessons as we go. 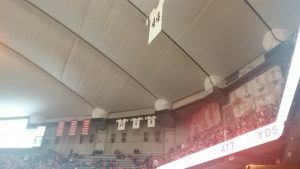 There’s plenty of history associated with the numbers on the roof of the Carrier Dome. No. 44 is in a class by itself, having been worn by such players as Jim Brown and Ernie Davis. Syracuse, like most old universities, has a Quad. It’s a big rectangle of grass, crisscrossed with sidewalks, with mostly academic buildings on the outside rim. It’s still the center of campus activity, even if other buildings now have been built in adjoining land parcels. There isn’t much parking in the area close to the stadium, so most fans have to take a bus to get to the area. That continues a long tradition, since football has been close to the Quad for more than a century. That brings us to a fellow named John Archbold. He was the owner of a small oil company more than 100 years ago who was bought out by John Rockefeller and Standard Oil. Archbold soon rose through the company ranks to become essentially Chief Operations Officer, even if no one used that term then. Rockefeller may have made a few dozen fortunes in the oil business in his lifetime, but Archbold did well too. In fact, Archbold earned enough money to give about $6 million to Syracuse University over the years. No wonder he was president of the Board of Trustees from 1893 until his death in 1916. Along the way Archbold completely funded the construction of a stadium, which opened in 1907 and quickly named after him. It was a grand place for its time, a big concrete bowl with a fancy entrance gate at one end. But time caught up with it. There were vast sections without seats, so on rainy days the water would dribble down to field level – soaking the pants of fans along the way. After seven decades of use, the infrastructure was crumbling. New safety rules reduced the capacity from 40,000 to under 30,000, essentially too small for a big-time football program. Could Syracuse find the money for a new stadium, or would it have to deemphasize football and drop down to playing nearby schools like Colgate and Cornell? Luckily, then-Governor Hugh Carey was thinking about his reelection hopes in 1978, and he targeted $15 million in state money to help pay for a new stadium for the private university – an interesting use of public funds, when you think about it. The money was approved, Carey won his election, and up went the 50,000-seat Carrier Dome. Amazingly, the Dome takes up less of a footprint on the grounds than Archbold; it went up and not out. The building opened in 1980. The air-supported dome is finishing up its fourth decade of use these days. The building never had a lot of frills. The concourses are crowded, and the bathrooms are jammed at halftime. What’s more, it can be really hot in the building early and late in the school year, since there is no air conditioning in a building whose name came from a sponsor in the air conditioning business. There’s talk of a nine-figure freshening of the structure in the near future, although we’ll see what shape that plan has when the first construction truck arrives at the door in 2020. Athletic officials probably thought every fast, good high school kid in the Northeast would want to play football in a dome close to home, thus ensuring winning teams for years to come. It hasn’t worked out that way, as the program has had some ups and downs over the years. However, the Carrier Dome did wonders for basketball at Syracuse. Kids from New York to California saw 30,000 people watching Big East basketball in a domed stadium in the Eighties, and decided they wanted to be part of the fun. The team has been a frequent occupant in the national rankings ever since. The view from the top of the end zone of the lower level of the Carrier Dome is a little like looking out from the inside of a mailbox. That brings us to 2018, where coach Dino Babers is looking to change Syracuse’s football fortunes. He came over from Bowling Green of the Mid-American Conference, where his teams went to two bowls in two years. Babers was known for a high-powered, aggressive offense at BG, and he brought the playbook to Syracuse. The Orange went 4-8 in both 2016 and 2017, scoring a lot of points but giving up just as many and then some much of the time. Syracuse had hopes of turning a corner in 2018, and came into Saturday’s game at 5-2. The Orange lost games to Clemson and Pittsburgh along the way, and could have won both of those games to be undefeated. N.C. State, meanwhile, had seen an undefeated season go by the wayside last week against Clemson, but was still ranked No. 22 in the polls. What happens when you match two teams that use four wide receivers at a time and never huddle? Right – offense, lots of offense. The numbers were rather staggering. Both quarterbacks threw for more than 400 yards and three touchdowns on the night. The teams combined for more than 1,100 yards in total offense, and played for well over three hours. I swear that both teams emptied their playbooks for this game, and every unusual play seemed to work for big yardage. It was a thrilling if exhausting night of football. Finally, though, the home team made a defensive play that proved decisive. Andrew Anderson made an interception in N.C. State territory in the final minutes, and Syracuse made a quick trip down the field and into the end zone for the clinching points. Syracuse finished with a 51-41 win for its sixth win of the season – making it bowl-eligible for the first time since 2013. The biggest crowd of the season – announced at 40,000 or so – headed for the exits at that point, feeling thoroughly entertained. Once they got through the revolving doors to get outside, they were greeted by the latest precipitation of a nearly all-day rain in Syracuse. Still, I wasn’t the only one smiling as I walked across the campus.